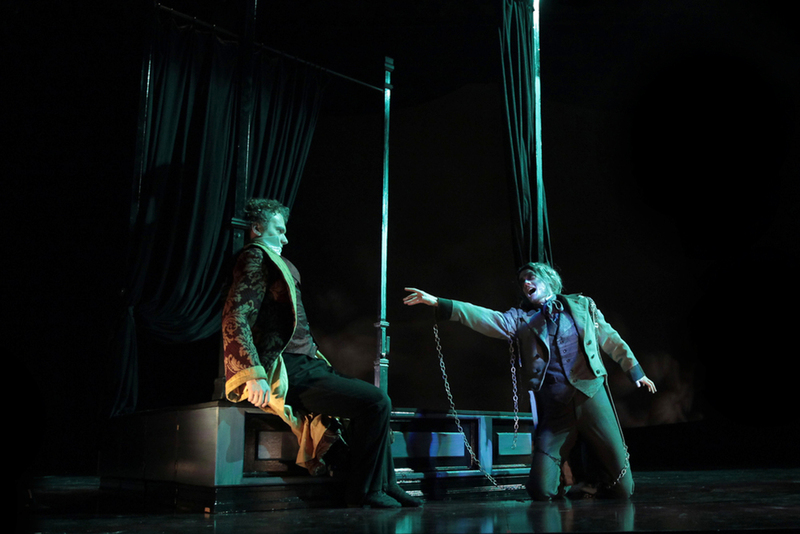 This production was a minimal physical theatre adaptation of the classic book, A Christmas Carol, emphasizing the ghost story themes in the original text, and using actors to portray most locations, props, and activities with their bodies. The main set pieces were a bed and standing desk, which both transformed into different shapes to establish different places, times, and objects. The motion of the bed was choreographed into the action, making the set an active participant in the dance. Puppetry was introduced into the ghost sequences, starting with the lost souls of Ignorance and Want, puppeted from within the robes of the Ghost of Christmas Present. The Ghost of Christmas Future was a large backpack puppet formed mostly from Styrofoam and masking tape to allow lightweight, sweeping movement. The design was deliberately kept simple to allow the ghost to blend seamlessly into the darkness of the set.